As we relive the glory days of the space program, we are also reminded how reckless the whole enterprise was. Once again, Americans are making movies about that time we went to the moon. Two years ago, “Hidden Figures” kicked off a mini rebirth of the genre, with a look at how racism caused NASA’s space program to hide the real geniuses behind the Apollo missions. This year’s “First Man” is a far more traditional (and far more white male focused) look at America’s path to the moon — with a possibly unintended underlying message. The dramatic retelling of the Gemini and Apollo space programs feels like it was supposed to be a testament to American ingenuity. One might argue that having these flaws front and center makes for a better, deeper film. In some cases it does feel more realistic to depict the moments of failure, both small and large, and to remind audiences that many of the catastrophes of the space program were due to carelessness and our heedless desire to be first. Men were being belted into canisters and perched on top of megatons of explosives without reliable seat belts. But at the same time, this realism also drives home how reckless the whole enterprise was. We didn’t get there because we were a whole lot better than the competition. We got there because that time they were lucky enough not to blow up. “First Man” focuses on the story of Neil Armstrong, played by Ryan Gosling, beginning when he was a test pilot for NASA in the early 1960s. When his baby daughter Karen dies of cancer in 1962, Armstrong decides to join the astronaut program, putting him on a collision course with the moon — and greatness. Gosling’s performance is a tour de force, and his co-stars do an excellent job of bolstering his Oscar chances. But Gosling and director Damien Chazelle make the choice to play Armstrong as a stoic, unemotional man who comes off as rather unlikable. (Don’t worry. Buzz Aldrin comes off much worse.) By refusing to have his character serve as the movie’s emotional center, Armstrong winds up being a bit of a cipher. Into that void rushes the reality of history. Today’s audiences have certain expectations for what a film like “First Man” will look like. The ability to take CGI and make something fantastic feel real means that moviegoers are in for a visual assault. “First Man” is to the space program what “Saving Private Ryan” was to the Normandy beaches of World War II; it details what it was to go into space in terrifying realistic detail. The film’s musical cues and heroic camera shots suggest that the failings of the space program were worth it. The moments of political turmoil are carefully chosen to depict arguments about how money spent on the space program could be better used here at home as foolish. Those in the space program had visions beyond this petty earth, the film suggests, and the problems of our country. 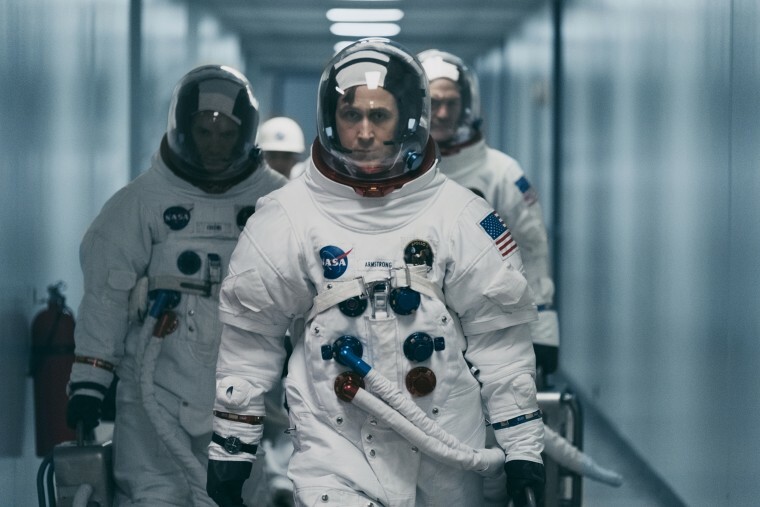 Try as “First Man” might to stay positive, cynicism seeps through. The movie may have opened widely in October as part of its Oscar campaign plan. But it's also thematically appropriate, because at times this drama feels like a horror movie, as an insane government program places unwitting men into tin cans, blowing them up two by two. At one point, far too late into the proceedings, the higher ups start questioning the costs of what they are doing, to which an incredulous Armstrong responds, essentially, that it’s a little late for second guessing. One gets the sense Armstrong's historic walk on the moon was made possible in part by the idea that once you discover you are already in hell, the best thing to do is keep going. This is not to say "First Man" is a bad movie. It is an effective — and affecting — immersive experience for those who wish to understand exactly what drives people like Elon Musk. It is also reminder that we as a country sent men to the moon at a time when navigational charts were giant paper maps. If we could do that then, imagine what we can accomplish now. That’s why films like these are still made, and why they still appeal to audiences today, despite the fact that no one has set foot on another planet since 1972. But after walking out of the film, I understood the emotional drive behind the false outcry over the lack of American flag. Back when this film debuted at the Venice Film Festival, Republican Sen. Marco Rubio, who was not at the festival and had not seen the film, tweeted out that it was “a disservice” that he’d heard the film didn’t depict the planting of the American flag on the moon. While clearly a cheap political ploy, Rubio’s complaint does encapsulate what a certain segment of the population wants from these retellings of our 1960s space program. They want to be told we made it to the moon because Americans are smarter, better, faster, stronger. This film, despite leaning towards heroics, ultimately doesn’t do that. Planting the flag would have felt wrong in this movie, a false note of over-the-top patriotism in a story that actually debunks the notion that our arrival on the moon was a product of exceptionalism. Americans did not walk on the moon because we were special, but because were stubborn. We could do it again, too. But at what cost?